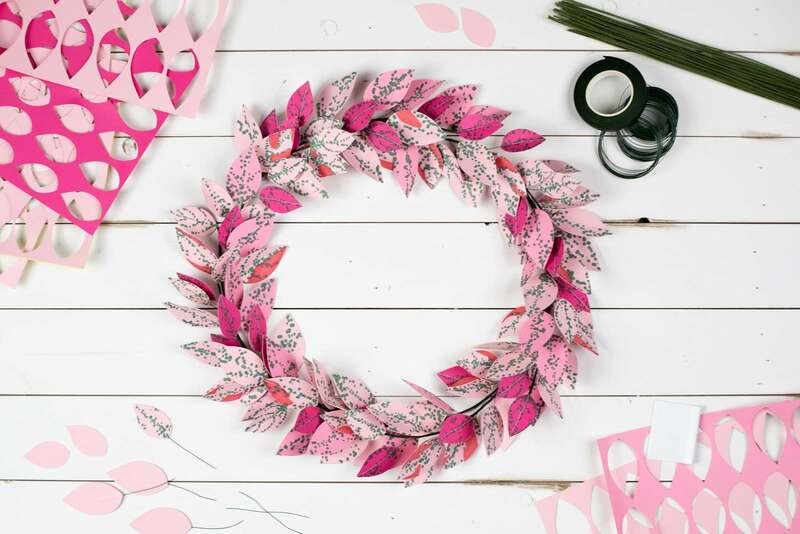 Wreaths are the perfect way to transition your home decor from one holiday to the next. 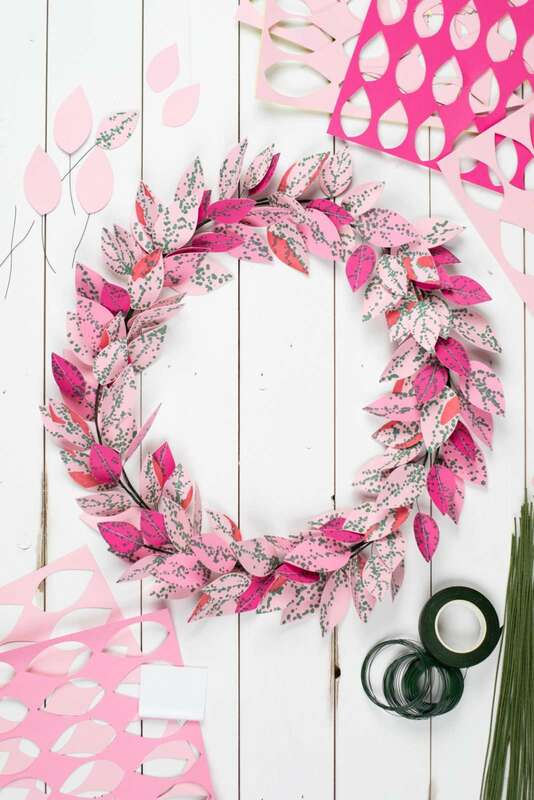 This pink polka dot leaf wreath is fitting for Valentine’s Day but will carry you all the way into spring! Have you ever seen a polka dot plant? Also known as a Freckle plant, it comes in beautiful shades of pink and green, and the leaves showcase sweet spots and splotches. So let’s brighten up that front door and get started! 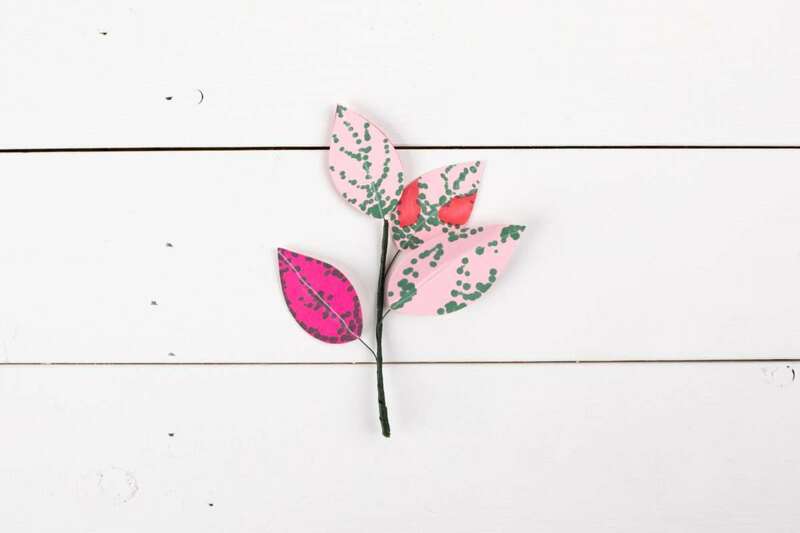 We’re going to use the double-sided adhesive and pink cardstock to create paper leaves that look lovely from both sides! 1. Take a piece of double-sided adhesive and remove the white liner. 2. 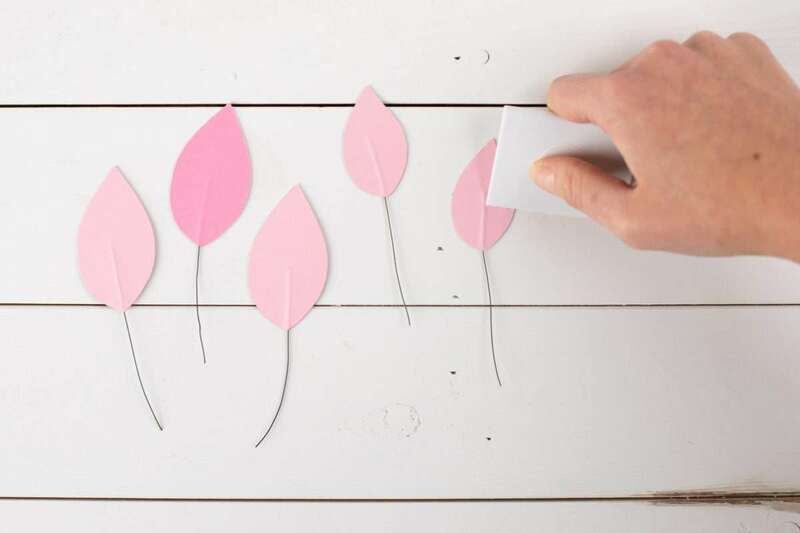 Take a piece of light pink cardstock and carefully align the paper with the sticky side of the adhesive. Smooth out any bubbles with the scrapper tool. 3. 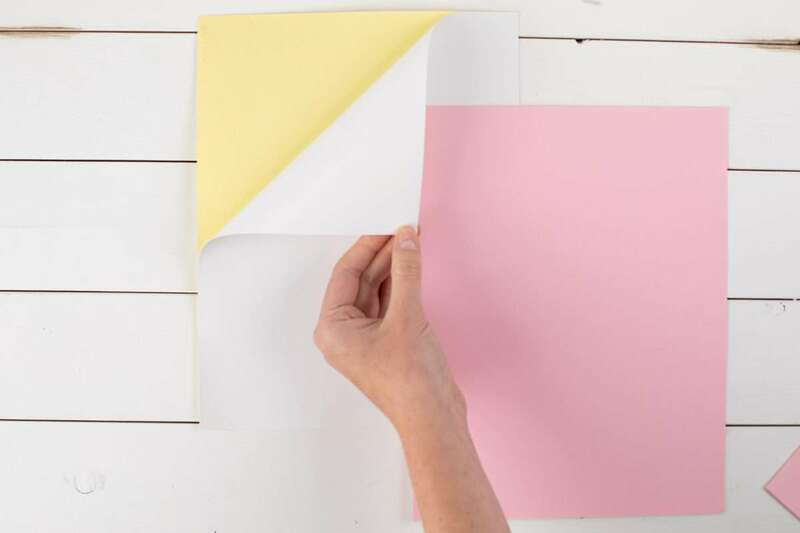 Repeat this process with the four other sheets of double-sided adhesive and light pink cardstock. Set these aside. 4. Cut 24-gauge spool wire into 3-inch pieces with strong scissors or wire cutters. You’ll need about 100 pieces total. 1. Open Silhouette Studio® and insert the Leaf Trio design (Design ID #21378). 2. Open the Page Setup panel and change the page dimensions to Letter (8.5 by 11.0 inches). 3. Ungroup the image by right-clicking and selecting Ungroup from the drop-down menu. 4. Delete the two leaves with the stems. 5. Select the remaining leaf, right-click, and select Ungroup. 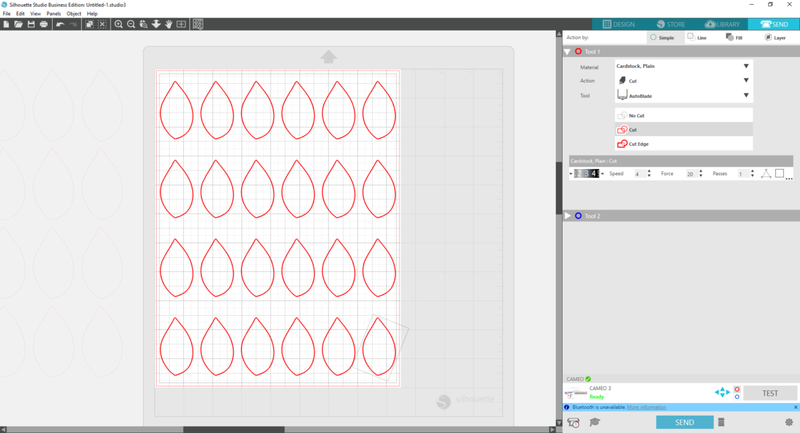 This will allow you to delete the inner leaf, leaving you with a single outline of a leaf. This is what we want! 7. Select the leaf and open the Replicate panel located on the right-hand toolbar. Select the Fill Page option. 8. Now you’re ready to cut! Select the SEND tab on the upper right side. Change the material to “Double-sided Adhesive.” Adjust your blade as necessary unless using the AutoBlade. 9. 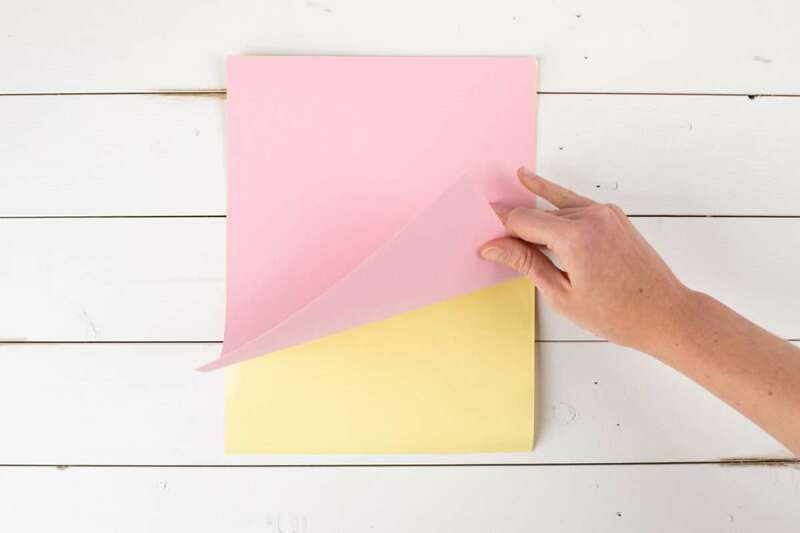 Align one piece of the double-sided adhesive/pink cardstock onto the cutting mat, with the yellow liner side down and pink side up, and then load the mat into the machine. Click Send to cut out the leaves. 10. Repeat for two more adhesive backed pieces of paper. 11. 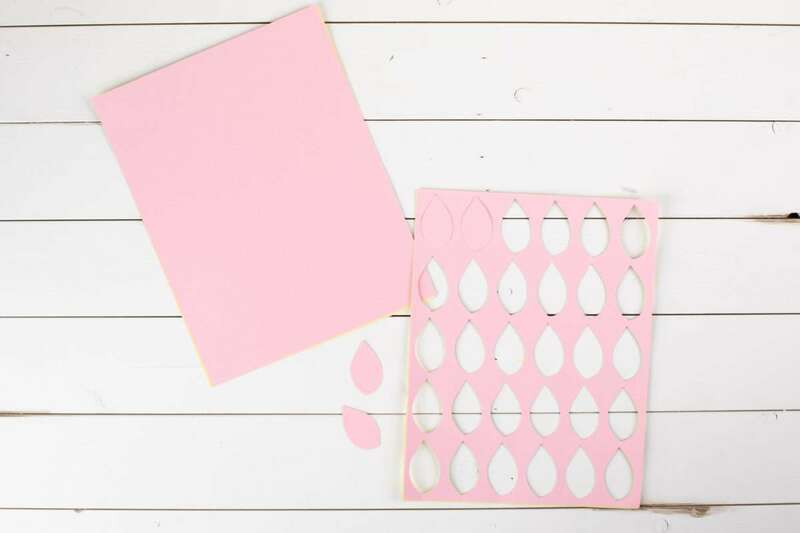 Change the material to “Cardstock, Textured- Heavy – (80 lb)” and cut 3 pieces of plain cardstock (without the adhesive backing)—2 light pink and 1 dark pink. 1. 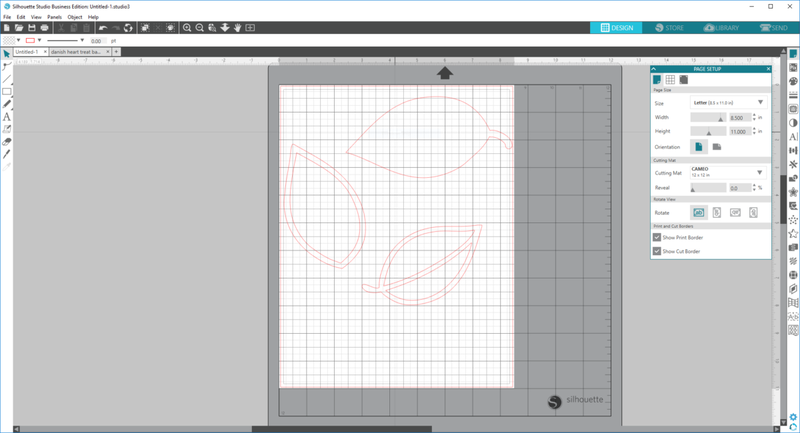 Return to Silhouette Studio® and select all of your leaves and move them off the cutting mat into the gray space. 2. Duplicate one leaf and drag in onto the cutting mat. Decrease the size of this leaf to 2 inches tall. 3. 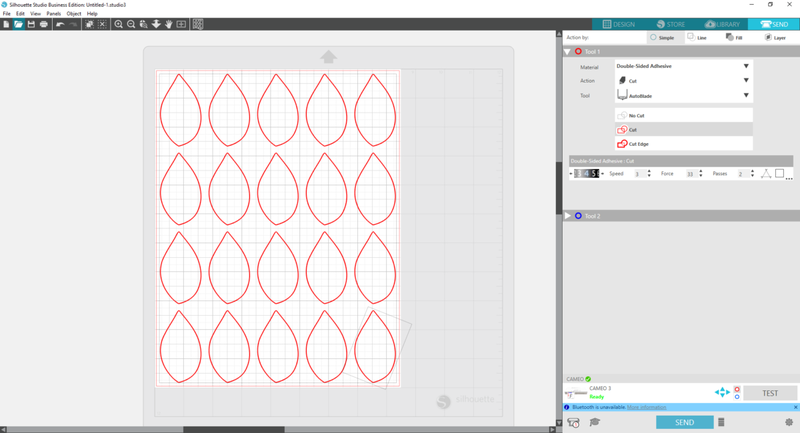 Select the leaf and click on the Replicate panel. Select the Fill Page option. 4. 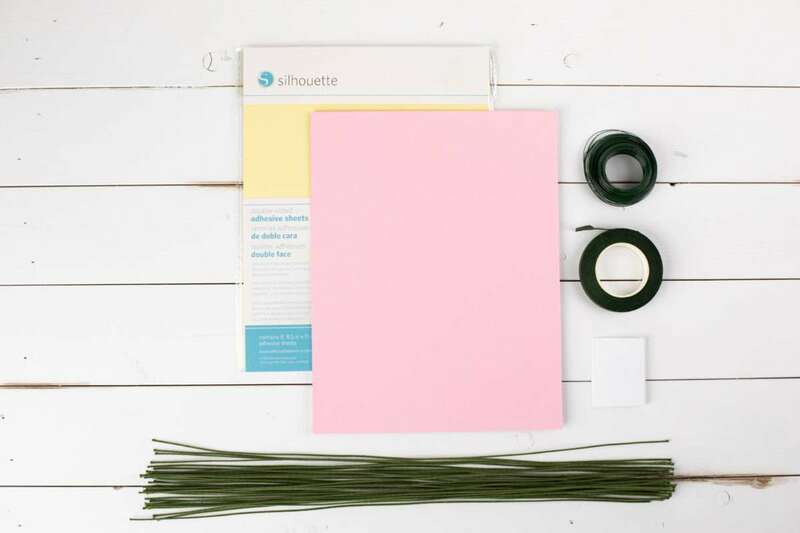 Select the Send tab and cut out the 2 remaining adhesive-backed pink pages and the 3 remaining pieces of plain cardstock. 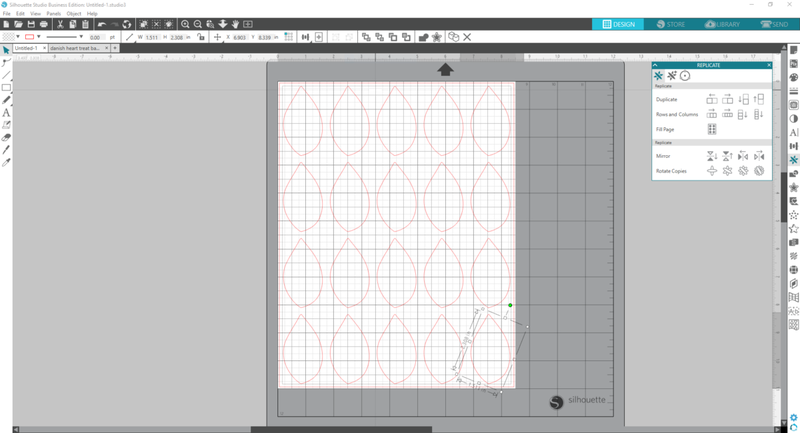 Make sure to change the material type in Silhouette Studio® as necessary. 1. Now that you have all your leaves cut, remove the yellow liners from the adhesive-backed leaves. 2. Place a cut wire with about about one inch onto a leaf and the remaining wire sticking out of the bottom. 3. Then place a plain paper leaf over the wire and smooth out the paper with the scraper tool. This sandwiches the wire between two pieces of paper, giving the leaf a clean appearance from both sides. 4. Repeat with all the leaves. 5. 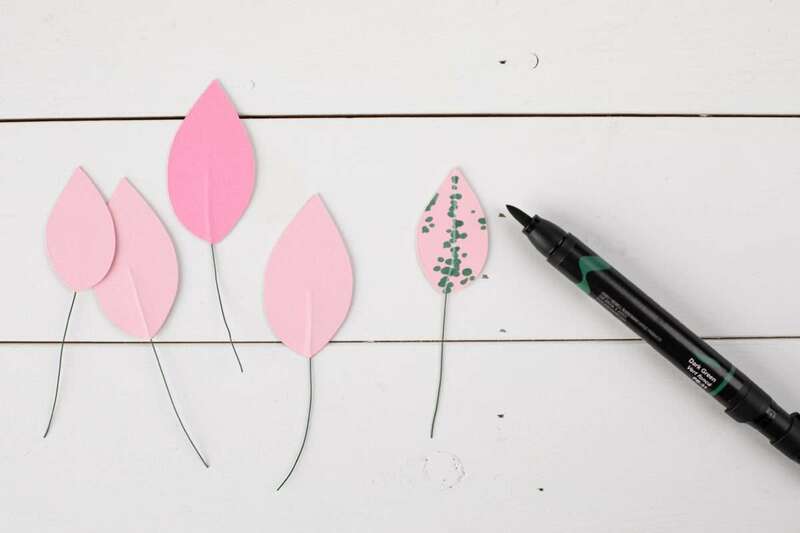 Add small dots with your green marker to one side of each leaf. 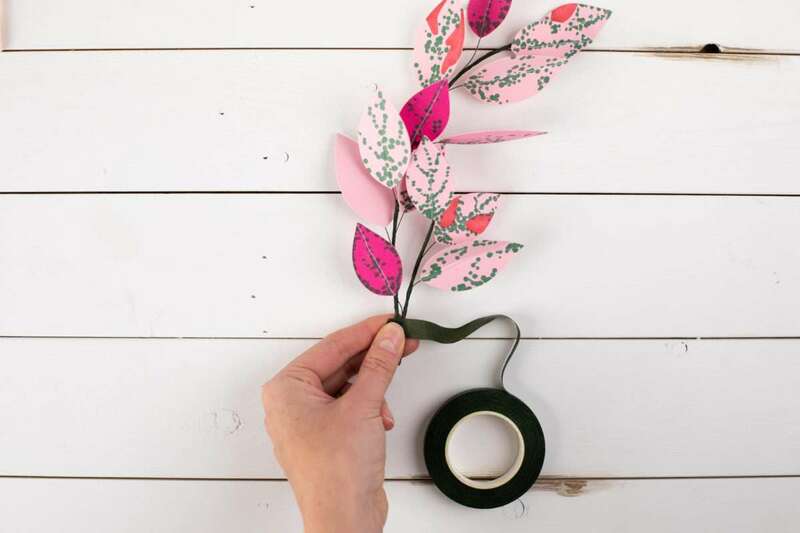 Then add a few splotches with your dark pink marker to just a handful of the leaves. 1. 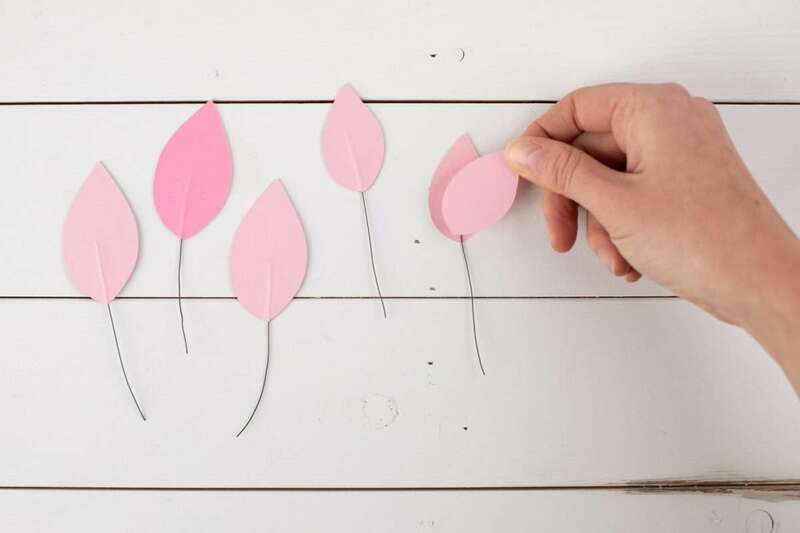 Cut your 18-gauge wire stems into 8-to-12-inch-long pieces. 2. 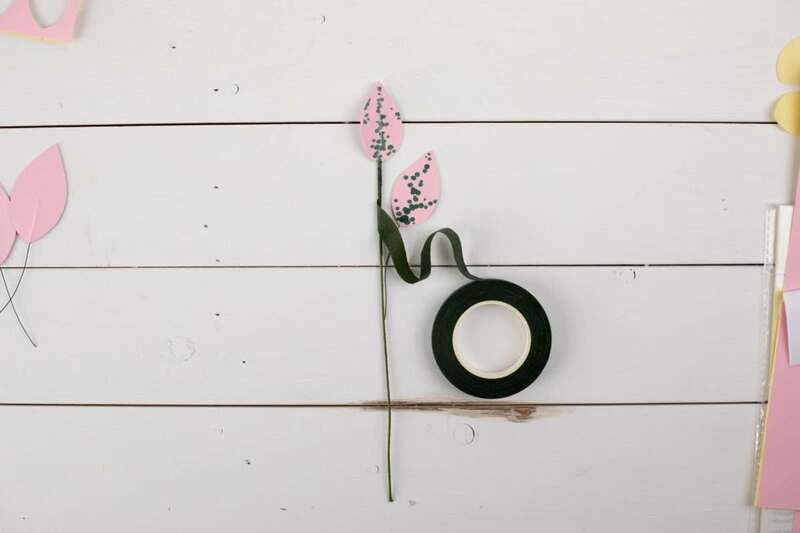 Take one wire piece and one leaf and wrap together with floral tape. Add another leaf an inch below the first and continue wrapping with the tape. Add leaves until you have a total of about 8 to 12 leaves on one stem. This creates a bough. 3. Repeat the step above to create more boughs until you’ve used all your leaves. 4. 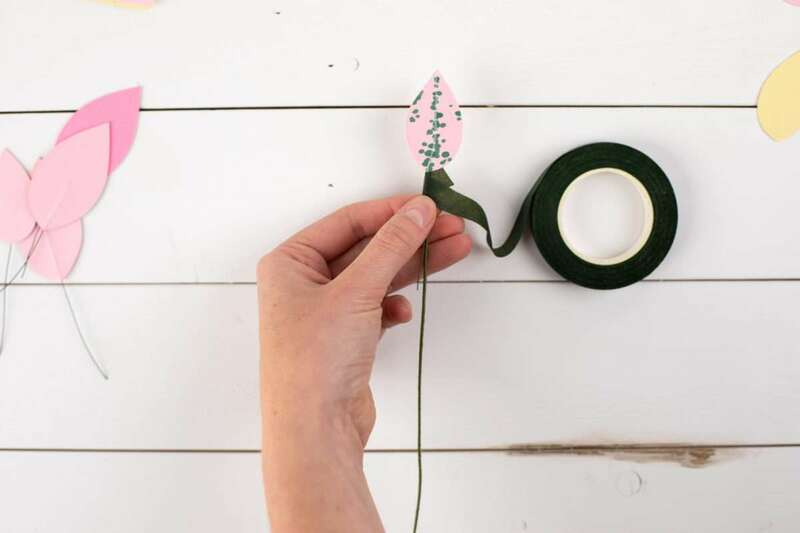 Then connect the boughs by overlapping the ends slightly and wrapping with floral tape. 5. Form the boughs into a circle by gently bending the wire stems. 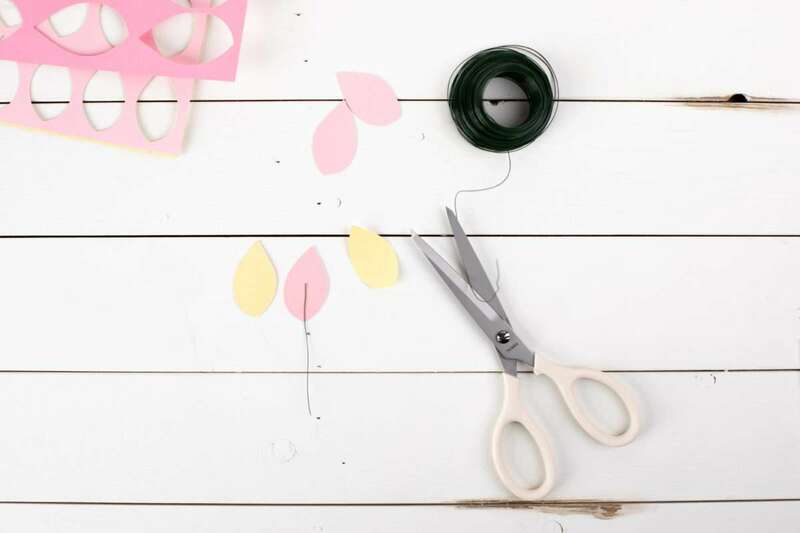 Fluff out the leaves and manipulate the wire gently with your hands. Ta da! Hang your wreath on a wreath hanger, and you’re sure to come home happier!